Earrings are a favourite accessory and can be a fashion statement as well as a coveted piece of precious jewellery. With many options, earrings can combine any precious metals, diamonds and other gemstones. From stylish and straightforward stud diamond earrings to a lavish display, GN Designer Jewellers have a wide range of diamond earrings to suit any style and budget. From pearl studs and diamond earrings to extravagant coloured gemstone earrings, earrings are a great gift option, especially due to there be being no need to know a size, so they can make a great surprise. Moreover, our diamond earrings can be made to suit pierced ears and un-pierced. GN Designer Jewellers specialises in custom-made jewellery, so your choice far exceeds the selection we have displayed on our website and in our Melbourne store. Any vision you have is achievable through our expert crafters and jewellery design team. We have an array of classic designs and modern, edgy diamond earrings, though if you are looking for something unique, bring your plans into the team and they will handcraft a genuinely bespoke pair of diamond earrings. You can browse our range for inspiration or draw inspiration from anywhere. Our jewellers will work closely with you to design a special and unique pair of diamond earrings that suit your budget. At GN Designer Jewellers, we offer obligation-free design appointments with a personal jeweller who can direct you to find the right pair of diamond earrings, and if we don’t have what you’re looking for our team can craft a new design just for you. With experience and knowledge and adhering to those all-important four C’s of diamonds – cut, colour, clarity and carat – we will help you make an informed decision about your new pair of diamond earrings. Whether buying earrings for yourself or as a gift, the helpful team at GN Designer Jewellers will help you find the perfect pair of diamond earrings in Melbourne. With so many options available the choice can be overwhelming, our team has the knowledge and experience to make your decision easy. Rest assured all our diamonds are sustainably sourced and conflict-free. You can work directly with GN Designer Jewellers to design a unique pair of diamond earrings. The team offers exceptional service, and our exquisite diamond earrings come with a lifetime guarantee. Purchasing your diamond earrings directly from our Melbourne workshop ensures excellent value for money. The extreme hardness of the diamond makes it a fitting symbol for consistency and durability. Its clarity also allows for sincerity and innocence to commonly be associated. Often a symbol of purity and perfection the diamond has, for a long time, been the stone that symbolises commitment and faithfulness. It is a symbol of light and brilliance. Earrings are known as one of the oldest ornaments, worn by various cultures throughout history. Worn by both men and women, earrings were worn primarily to frame and embellish the face, though they were often used to signify the wearer’s position in society as well as expressing their values. Earrings, with the vast range available, are a perfect way to reflect and emphasise your identity. The right set of earrings can be the perfect compliment to any face. Accentuating facial features and reflecting the personality, any mood can be expressed through jewellery choice. Diamond earrings can be a subtle way to spark curiosity in the eye of an observer, and their sparkle will instantly draw attention to the face. The perfect accessory, earrings allow your natural confidence to shine with the help of GN Designer Jewellers selection of precious jewels. We seek to accentuate the beauty and display the personality of the wearer with our custom diamond earrings. The range of earrings available – small diamond studs, to dramatic hoops – can add symmetry to the face and add grace and class to any wearer. Diamond earrings can dramatically enhance any outfit, from casual to formal. There are so many styles of earring available, so here is a brief overview of some of the most popular styles. Studs are the most straightforward and smallest design, consisting of a diamond, gemstone, or metal ball generally placed in the centre of the earlobe. Studs are a classic choice that can compliment any outfit. Sparkle can be added to your earlobe with diamond earring studs, securing the diamond in place with simple prongs to ensure the diamond remains the focus. Gemstone studs are a great twist to add colour and showcase the personality of the wearer from romantic rubies, to elegant emeralds. Classic and colourful, stud earrings never go out of style. Simple metal studs are also an option for a more casual look. Drop earrings are regal and feminine, created to dangle from the earlobe. They can feature a combination of diamonds, gemstones, and precious metals to achieve a unique result. Ranging from just an inch to shoulder length, you can be sure to find drop earrings for any occasion. A chandelier earring is designed to embody the silhouette of a chandelier and dangle below the earlobe, featuring several dangling stones or metal pieces designed to twinkle. Drop earrings in silver, gold or platinum are a trendy, modern accessory available in a multitude of styles. 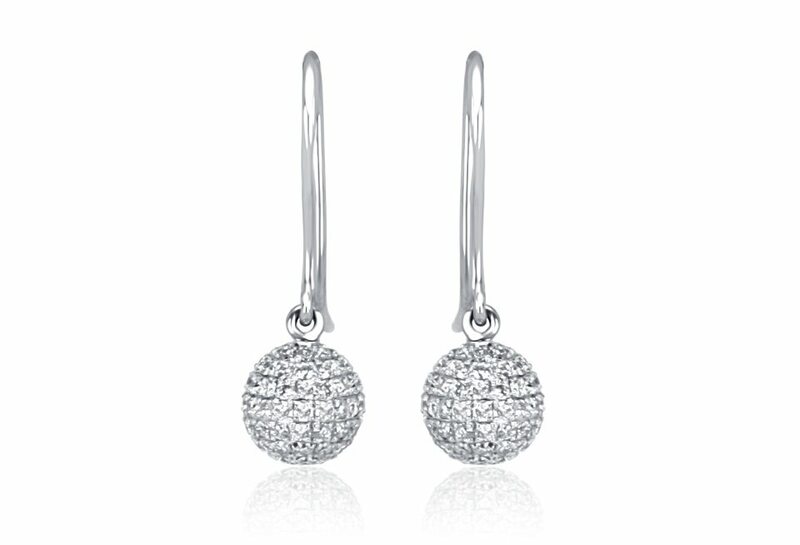 Diamond drop earrings often form a line or curved shape encrusted with diamonds. A favourite drop earring is the journey style – each diamond increases in size along the curve of the earring. You can use precious gemstones, diamonds or any variety or combination. Gems are perfect if you’re looking to add colour or personality to your jewellery collection. Hoop earrings can be created in solid metal or set with diamonds and gemstones, available in a variety of sizes to accommodate any look. For more information about our collection of diamond earrings in Melbourne, contact GN Designer Jewellers today.